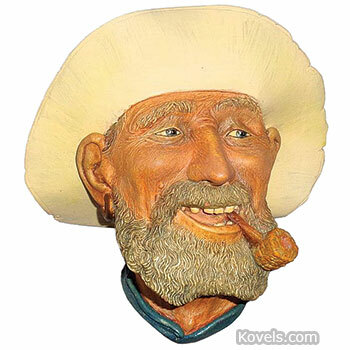 Bossons character wall masks (heads), plaques, figurines, and other decorative pieces were made by W.H. Bossons, Ltd., of Congleton, England. Before starting his company, Bossons used his artistic skills to make pieces like lead soldiers for his friends. The company was founded in 1946 and closed in 1996. Dates shown are the date the item was introduced.